Mohamad Hasan greets people in Sendayan, part of the Rantau seat which he is contesting on April 13. SEREMBAN: Umno acting president Mohamad Hasan says the accusations of theft and embezzlement related to 1MDB against Najib Razak are baseless, and challenges the authorities to bring solid proof that could put the former leader behind bars. But Mohamad added that 10 months after the change of government, Najib is still free despite repeated references to the 1MDB scandal by Pakatan Harapan (PH) politicians. 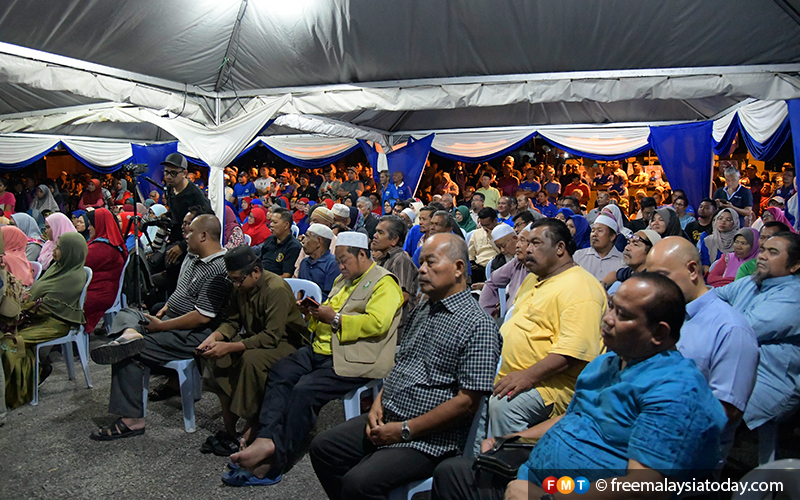 “In Parliament, it is always about 1MDB,” Mohamad, better known as Tok Mat, told a late-night ceramah in Kampung Sendayan, Rantau, where he is trying to retain the state seat for Barisan Nasional after his default win was nullified by the election court last year. 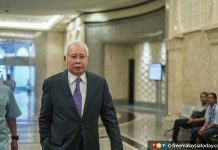 He said Najib has yet to be found guilty in the 1MDB scandal, adding that the fact that Najib is still free shows that the allegations against him “are all lies and slander”. Najib is due to visit Rantau today, where he is likely to capitalise on his “Bossku” tagline which has gained popularity among Malay youths in recent months. Yesterday, he claimed trial to seven charges of power abuse, money laundering and criminal breach of trust related to SRC International, a former subsidiary of 1MDB. Mohamad urged people in Rantau to welcome Najib. “You all should give your moral support to him because of his many good deeds,” said the former Negeri Sembilan menteri besar. “If he has committed an offence, that is his problem. 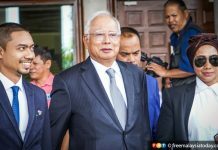 But without Najib’s help, I would have never been successful in developing Sendayan,” he said, describing the township as “Negeri Sembilan’s Damansara”, referring to downtown Kuala Lumpur’s affluent neighbourhood. The crowd at the Barisan Nasional ceramah in Sendayan. 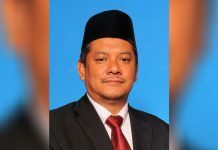 The Rantau seat, part of the Rembau federal constituency represented by Khairy Jamaluddin, has been held by Mohamad since 2004. It neighbours PH strongholds such as Port Dickson, Rasah and Seremban. Mohamad is facing PH’s Dr Streram Sinnasamy from PKR, as well as independents Malar Rajaram and Mohd Nor Yassin. Meanwhile, Mohamad again defended Umno’s cooperation with PAS. “If I want to hug and kiss their cheeks, even if I want to hug, that is my problem, why is it a problem for you?” he asked. He dismissed fears of a Taliban-style rule in Malaysia if an Umno-PAS alliance comes to power. He said Umno had worked together with PAS in the aftermath of the 1969 race riots.